This is a brief post to let you know that Alfred 2.6 is now in pre-release, ahead of this afternoon’s general release of Alfred 2.6 and Alfred Remote for iOS. You can update to the Alfred 2.6 pre-release to help us test it. If you don’t yet follow pre-releases, you can do so by launching Alfred’s Update preferences, choosing “Pre-releases” from the dropdown menu at the bottom of the preferences. As Remote is not yet available in the iTunes App Store, the link to the App Store in Alfred’s Remote preferences won’t work yet. However, you’ll be able to start creating pages for your Remote and setting up your workflows to include Remote triggers. After many months of development and beta testing, Alfred v2 has now officially landed! You can download Alfred v2 from our website to start using the new v2 features, as well as the many improved ones you’ll recognise and love from v1. Alfred v2 is re-written from the ground up to be faster, more efficient and easier to use. Overall, less than 15% of Alfred v1’s code was reused, and every feature was carefully improved and given the love it needs. Some of the highlights of v2 include the new Workflows framework, which we sneak peeked for you during the beta and replaces the Extensions from v1. Alfred users have created amazing workflows, some of which you can find on the new Alfred forum. To get you started, we’ve included a few examples, which you can find by clicking the + button at the bottom of the Workflows sidebar. You’ll also find a wide range of templates when clicking the same + button, to quick-start your workflow. From simply connecting a hotkey to a single file, to creating a complex script workflow with multiple steps and notifications, you’ll be able to bend workflows to your will. You asked and we delivered. 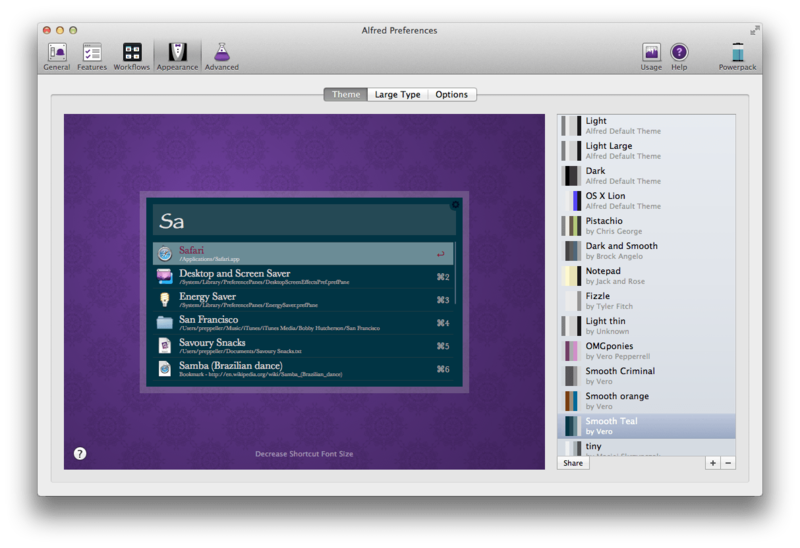 Themes are now more flexible to allow you to make Alfred as big or small as you need. Create a new theme, then choose the fonts, sizes, colours, corner shape and spacing you prefer. Make your theme as beautiful (or as wacky!) as you want. You can share themes and download others on the Alfred forum. In Alfred v1, we relied on the OS X metadata to present your Contacts in search results. Occasionally, this meant that contacts would not appear in search results, as the metadata had become corrupted. We now use the Contacts API instead, which is far more reliable and robust. There’s much more to Alfred v2 than I can cover in this launch post. Over the coming weeks, we’ll be publishing many tutorials on the new v2 features, which will help you discover what you can do. We’ll also be launching an Extras gallery for our favourite workflows and themes. In the meantime, here’s a v2 primer for users who are upgrading from Alfred v1. And finally, thank you to the Mega Supporters who took the time to help us test the beta over the past two months; we are so lucky to have such a wonderful community of Alfred supporters! Today, Alfred 1.3.1 has been released. The main new feature of this release is especially for Mountain Lion users; you can now use Notification Centre instead of Growl for extensions and general Alfred notifications. Another handy improvement for Powerpack users is that when copying/moving files, Alfred will remember the destination folders, making it easier to move files next time! This release also includes some nice bug fixes and little improvements, which you can find in the Change Log. Note that if you’re already using pre-release build 261, there’s no need to update as this is the same build. Otherwise, check for updates in-app or download version 1.3.1 from our website. Today, Alfred 1.3 is available through auto-update [non-Mac App Store] and from our website with lots of lovely additions. We’ve been using these new features ourselves over the past few weeks and already can’t live without them! You can now pick multiple files directly from Finder or navigate to them in Alfred and add them to your file buffer. Once you’ve picked all your files, you can perform an action on all of them. With this feature in your hands, Speedy Gonzales will be left in the dust behind you! You’ve been clamouring for QuickLook integration, and here it is. Preview your files and documents using OS X’s QuickLook by pressing Shift or ⌘Y. Simple yet so useful! We’ve added a compact view in Alfred’s Appearance preferences, allowing you to make Alfred’s results view smaller. Handy for users of the shiny new Retina Display MacBook Pros. Alfred will now show you all matched results for your Default Results searches; Just keep scrolling down for more results. We’ve made the very popular integration with 1Password even better, by making Alfred find and handle your 1Click bookmarks even more intelligently. You can also choose to include your 1Password bookmarks in default results without the “1p” keyword and copy the 1Click URL to clipboard with ⌘C. Once again, the change log for this release is pretty hefty with many more improvements and fixed, so if you’re curious, grab a coffee and read all the details.